Nasdaq in record territory… a War on Cash update (major U.S. banks involved)… ancient Rome and modern America… and more! So the Russkies can play the sanctions game too, it seems. As you might be aware, the United States has laid progressively stronger economic sanctions on Russia since 2014. As you might not be aware — because it runs counter to the mainstream narrative — this process begun under Obama has continued under Trump. The punishment — up to four years in prison or a fine up to 600,000 rubles (just under $10,000). “This puts global corporations between a rock and a hard place,” says our macroeconomic maven Jim Rickards. “If companies don’t comply with U.S. sanctions, they can have their assets frozen by the U.S. If companies do comply with U.S. sanctions, they can be thrown in jail by the Russians. Take your pick. “We should expect these financial wars with Russia, China, Iran, Syria, North Korea, Venezuela and perhaps Turkey to continue for years to come. The main victim is world trade and world growth. For all we know, the first shot might be fired only days from now… as dueling summits get underway. 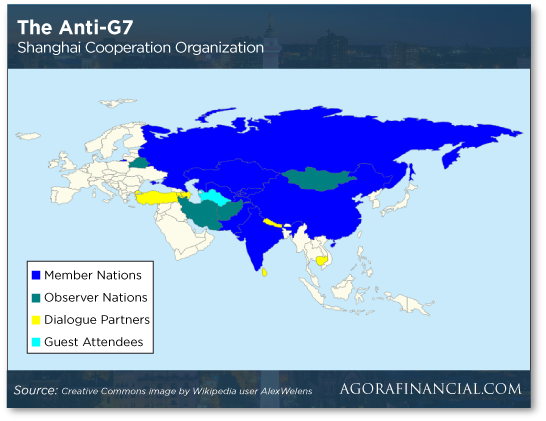 Meanwhile, what you might call the “anti-G-7” gets underway Thursday in Qingdao, China. It’s a no-Westerners-allowed club called the Shanghai Cooperation Organization. Its dominant members are Russia and China. Several of the “Stan” countries that used to belong to the Soviet Union are also members. Last year, archenemies India and Pakistan decided they had enough common ground to both join up. Iran has “observer” status, perhaps on its way to full membership. Western media usually ignore the SCO’s annual meetings, figuring they’re meaningless photo ops. As a result, they miss significant news — as in 2014, when we took note of Russia and China accelerating their plans to settle trade with each other in yuan and rubles, bypassing the U.S. dollar. And China, in particular, is taking the long view. Jim reminds us this week of a story about the diplomatic buildup to President Nixon’s famous visit to Beijing in 1972. National Security Adviser Henry Kissinger met secretly with Zhou Enlai, Mao Zedong’s right-hand man. As the story goes, Kissinger asked Zhou to assess the impact of the 1789 French Revolution. “It’s too early to tell,” Zhou supposedly said. With that in mind, the Axios website had a report recently about China’s massive “Belt and Road” project — a recreation of the ancient Silk Road on land, along with a new maritime trading belt. We’ve mentioned “Belt and Road” here before, but probably not enough. It’s massive. That’s long-term thinking. In contrast, “Americans are transfixed by Stormy Daniels, Donald Trump Jr.’s divorce, a new royal wedding and other fluff,” Jim goes on. “Perhaps the best example of this dichotomy is that China has tripled its gold reserves in the past 10 years while Americans exhibit almost no interest in gold. China knows that gold is the best way to preserve wealth when the Americans inevitably turn to inflation to solve their problem with nonsustainable national debt. But in the short term, gold languishes below $1,300 as we turn our gaze to the markets today. The Dow and the S&P 500 are down a bit, but the Nasdaq is inching higher into record territory at 7,611. Ditto the small-cap Russell 2000 at 1,655. Treasury yields are backing down, the 10-year note at 2.91%. Crude remains below $65 a barrel as the White House is supposedly trying to lean on OPEC to boost oil production by a million barrels a day. Well, that’s what Bloomberg is reporting. “It’s unusual for Washington to ask for a specific output hike,” says a report citing anonymous sources. A million barrels a day happens to be the amount of Iranian oil that came back on the market after the signing of the Iran nuclear deal in 2015. But with U.S. withdrawal from the deal and a return to sanctions, that supply could quickly dry up. While crude has pulled back lately, a barrel of West Texas Intermediate still costs 39% more than it did a year ago. And the national average for a gallon of regular unleaded gasoline has leaped from $2.38 to $2.94. For many Americans, a huge amount of the bigger paycheck made possible by tax cuts is going right into the gas tank — with only five months before the midterm elections. That was quick: “Just three weeks after the U.S. Supreme Court cleared the way for states to legalize sports betting, Delaware will be the first place outside of Nevada to allow bettors to wager on the outcome of individual games,” writes Nikhil Sridhar at Reason. Starting this afternoon, Delaware’s three casinos will accept bets on a variety of pro sports events — and just in time for Game 3 of the NBA championship tomorrow tonight. For the moment, you still have to show up in person to place your bets, but the state lottery director says a mobile app is on the way. Among the other states expected to act soon — Pennsylvania, New Jersey, Connecticut, Mississippi and West Virginia. It was Agora Financial contributor Andrew Keene who accurately called the Supreme Court decision before it happened. And he says it’s not too late to position yourself to profit — there’s still a two-week window in which you can act and line yourself up for gains as high as 3,723%. Details here — no long video to watch. “Here’s a war on cash update from Texas,” a reader writes after yesterday’s 5. “My sister who lives in California owns a rental house in my Texas neighborhood. The tenant has been giving me the rent in cash and I deposit it into her Wells Fargo account using her deposit slips. That way she has immediate access to the funds without waiting for an out-of-state check to clear. Or HAD, I should say. “All was well until June 1. Now they will not accept a cash deposit into any personal account other than your own. Doesn’t matter that I’m her brother running an errand for her with her own deposit slip. I was informed that I could only make the deposit by check or money order. Which makes zero sense from a criminal activity standpoint, considering you can still buy a money order for cash without ID. “My sis did not take this well and took it up with her Wells Fargo banker in California. He told her the new policy started May 24 and Chase and Bank of America had already done the same. Not something the feds have mandated but are ‘encouraging,’ according to him. “Thanks for the reference,” writes a history professor at a state university in the Midwest who hadn’t run across Sir John Glubb and his 250-year life cycle of empires until we mentioned them last week. This reader, like the one yesterday, questions when the American empire began. “Starting the 250-year clock at 1776 may be an error. “The U.S. was certainly expansionist, even before 1776, as Colonials kept pushing west past the Proclamation Line of 1763, but the founding generation never intended the U.S. to become an empire. Jefferson’s Northwest Ordinance of 1787 set up a process by which acquired territory could become states on an equal footing with existing states. “An argument can be made that the U.S. became an empire in 1898 with the Spanish-American War, because at that time the U.S. acquired/conquered territories that were never going to become states: Cuba, Puerto Rico, Guam, the Philippines. Mark Twain and the Anti-Imperialist League he supported certainly thought the U.S. was becoming an empire. The 5: For what it’s worth, Glubb dated the Roman Empire from 27 B.C.–A.D. 180 — just 207 years. That end date happens to be Edward Gibbon’s marker for the start of the empire’s decline. Your analogy is intriguing. A quick trip through Wikipedia reveals the conquest of Dacia was completed in A.D. 117. If memory serves, that was the very year the empire’s territorial reach was its greatest. It was all downhill from there. That said, the empire hung in there for another three and a half centuries. P.S. After we hit “send” yesterday, we got a note from Alan Knuckman that his Weekly Wealth Alert readers were filled on two more sell orders — Twitter call options good for 101% gains in two weeks and Microsoft calls good for 49% in a one week. That’s on top of 50% and 75% winners booked on Friday. Alan’s next trade is due no later than next Monday. It could make a dramatic difference to your retirement in a short amount of as you can see in this vivid demonstration.